To me vacationing in Western Europe means sitting atop a cliff in Majorca surrounded by the deep blue Mediterranean, feasting on prawns the length of a man’s hand, split from head to tail and grilled over an open fire. Dressed with a drizzle of olive oil, a squeeze of lemon and a pinch of salt. Digging into crisp bottomed paella, bright yellow from saffron, loaded with spicy chorizo and briny shellfish. Enjoying a leisurely lunch at a sidewalk bistro in Paris. Tearing off a hunk from a still warm baguette and generously covering it with rich liver pâté. Hands hovering over a wooden board loaded with cheese, pickles and charcuterie. The hardest decision of the day is trying to decide between the duck mousse and rabbit rillettes. Pausing at a hill town in Tuscany to savor a plate of delicate potato gnocchi covered in the most beautiful blanket… shaved black truffles. Dizzy from their pungent earthy charms I begin to fantasize about cashing out my 401K, buying a villa, (in my delirious state my meager 401K has turned into millions) and spending my days staring out at the rolling hills and statuesque cypress trees. This is the Europe of my past trips. So, when the chance came to spend a week in Amsterdam, I booked a flight immediately. I had been warned that the term “Dutch cuisine” was an oxymoron, but wasn’t too worried. After all, Amsterdam is a short train ride from Brussels and Paris. Surely the French managed to slip some culinary secrets their way. Besides, Amsterdam is famously known for its liberal stance on legalized pot. A city with a perpetual case of the munchies—I reasoned—is bound to have some fairly decent late night snacks. If I were using very simple word association to describe cuisines, I would say Korean … garlicky, Indian…complex, Vietnamese…herbal, Dutch….flat. 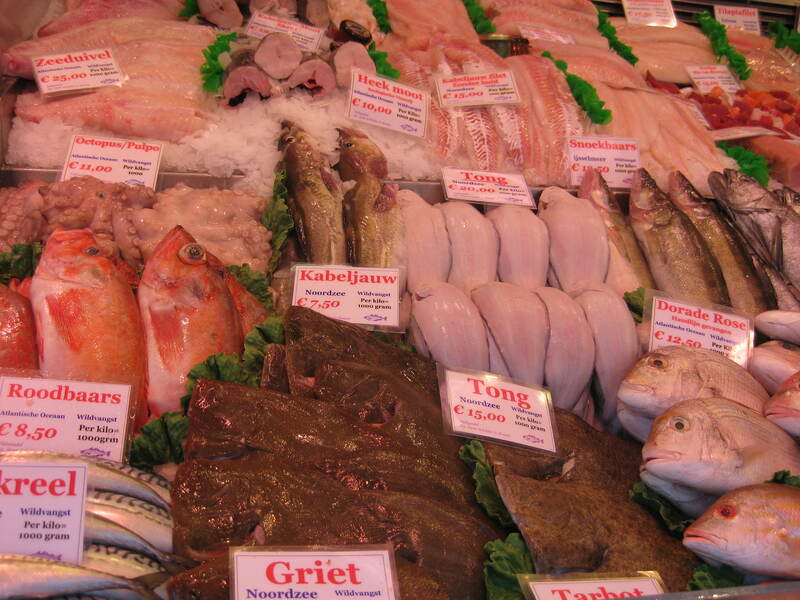 The Dutch food I encountered completely lacked distinct flavor—no acid, sweetness or spice. Above all, it was seriously missing salt. Your palate lies limp. Like a bad marriage bed, it’s present for the act but secretly hoping for a premature end. I was excited to try the French fries in Amsterdam, but it would seem that French potato magic didn’t make it past Belgium. 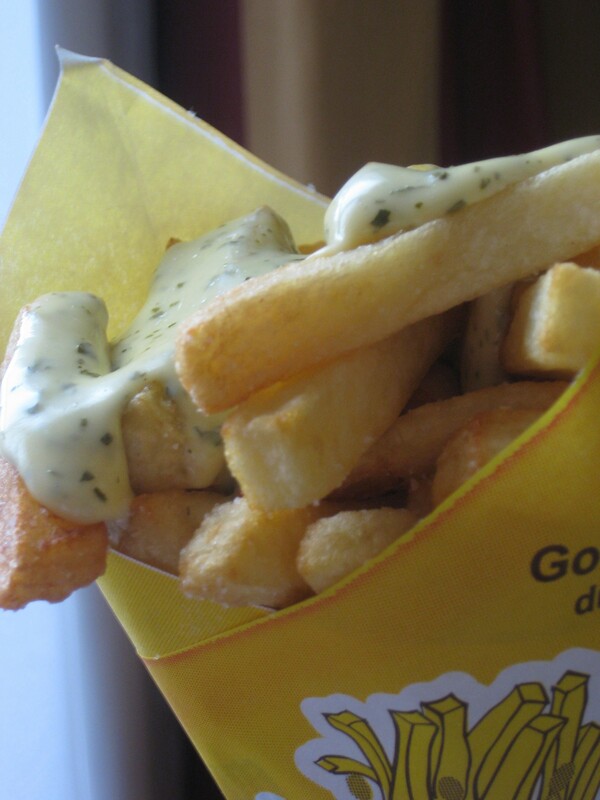 The Dutch fries are cut thick and smothered with mayonnaise. I don’t know how you can make garlic-herb mayonnaise flop, but they accomplished it with their overly sweet goop. I couldn’t bring myself to order the popular deep fried skinless meat sausage or breaded meat ragout after the disappointing Dutch fries. Ground meat mixed with flour, breaded and fried like a croquette must be the answer to midnight munchies. On the tourist filled street Leidsestraat, an entire shop consists of hot snacks that can be purchased out of vending machines. A large fry station in the back of the establishment keeps the front machines filled. While this is may be a brilliant answer to dealing with the annoying, stoned tourists, a culinary treat it is not. Perplexingly, the Dutch don’t lack for quality ingredients. The local market displayed some of the most beautiful seafood I’d ever seen. This left me to speculate on the unfortunate events that must occur on its trip from the market to the dinner plate. However, all is not lost. If you do find yourself in Amsterdam, and in desperate need to arouse your palate head over to the Peruvian restaurant, Casa Peru. Their lomo saltado— strips of savory beef pan-fried with fries, tomatoes, onions, ginger and cilantro—was the most flavorful plate of food I had while I was there. It had everything other dishes were missing: acid from tomatoes, sweetness from the caramelized onions, punchy ginger and herbal cilantro. 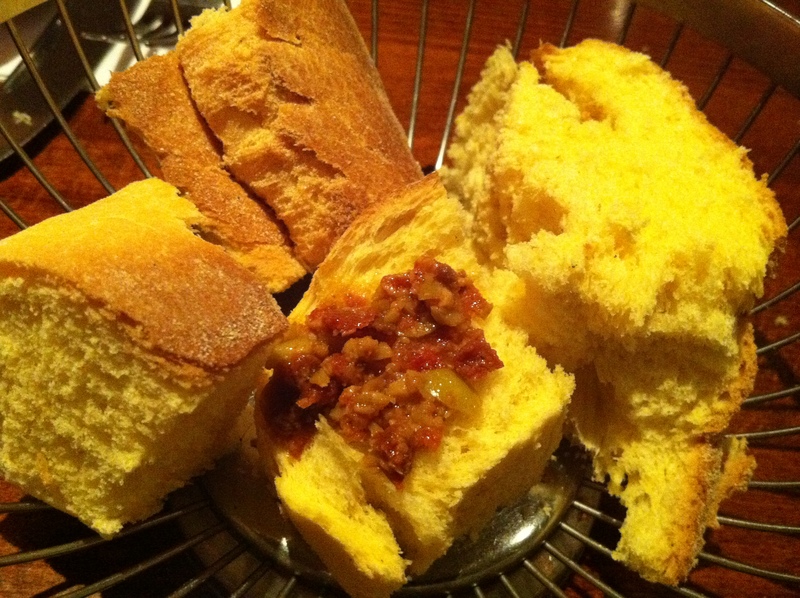 The fluffy homemade bread is served with an olive and sun dried tomato tapenade. You will be fighting with your dining partners for the honor of licking the bowl. If you’re in the mood for French food—and don’t want to blow a month’s rent for dinner at a Michelin-starred restaurant—visit Cote Ouest. 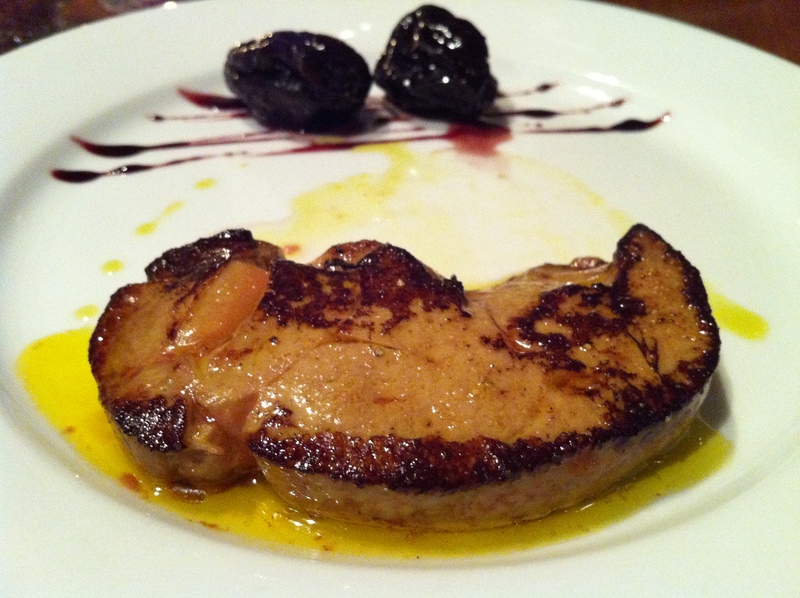 Seared duck liver with stewed prunes required a couple generous shakes of salt, but the sweet prunes balanced the liver nicely. Together they make a luscious spread for slices of baguette. The mussels could use a boost of flavor, perhaps they’ve been muted to suit the Dutch palate. But the French fries are thin, crisp, and thankfully someone in the kitchen knows how to make a good mayonnaise. The classic sole meunière, aided by a lemon wedge and saucer of melted butter, is simple but pleasant. Initially you may find yourself reaching for the saltshaker, but once you adjust the seasoning everything is quite satisfactory. Perhaps I shouldn’t judge the cuisine before having a chance to enjoy a true Dutch delicacy—herring. I find the thought of buying a raw herring from a fish stall, covering it in onions, cocking my head back and chowing down like a hungry pelican both fascinating and terrifying. Amsterdam is not a food vacation spot. However, its gorgeous architecture, canals, and people watching make it a fabulous city worth visiting. I will definitely return. However, next time I’ll be sure to tack on a few days at the end of the trip to fulfill some culinary fantasies… in France. Fascinating and funny, I love your wit and sense of humor! Now I’m ready to start the day. Let’s see what’s for lunch. 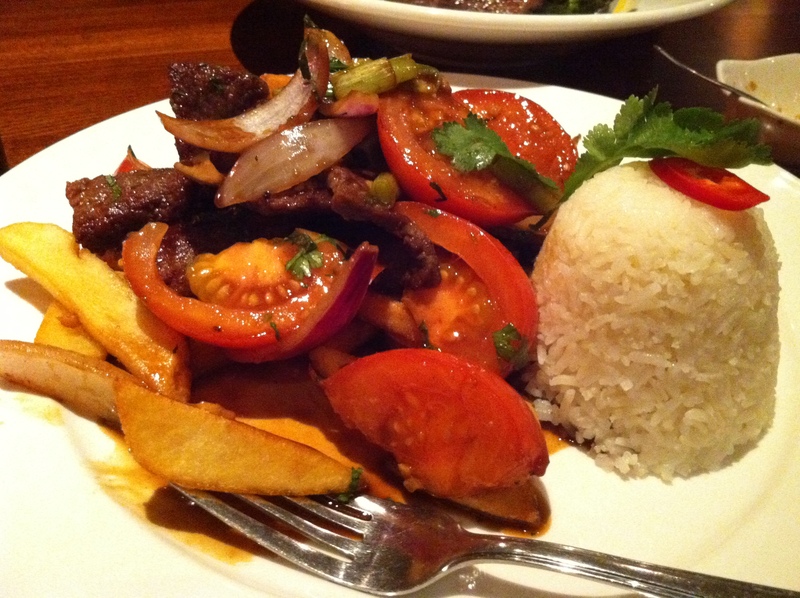 I think we’ll get Oli to take a crack at that ‘lomo saltado’. Thanks! Oliver is a genius in the kitchen. I’m sure he’ll master lomo saltado in no time at all.